Special Representative for Afghanistan Reconciliation Zalmay Khalilzad approaches the microphone to speak on the prospects for peace, Feb. 8, 2019, at the U.S. Institute of Peace, in Washington. 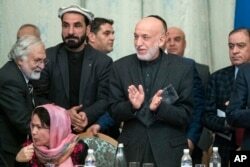 Former Afghan President Hamid Karzai, second from right, applauds during the talks in Moscow, Feb. 6, 2019. The Taliban have so far refused to negotiate with the government of President Ashraf Ghani. Khalilzad attended a six-day meeting with Taliban leaders in Qatar last month and afterward reported “significant progress” in the negotiations, which culminated in a basic framework for a peace agreement. 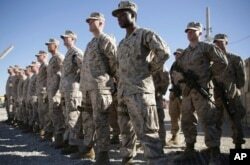 It called for the Taliban to prevent international terrorist groups from basing themselves in Afghanistan and for the United States to withdraw its forces from the country. “All sides have learned lessons from the past. So the time has come, they say, for an inclusive dialogue leading to an inclusive peace. That will not be easy. ... But it’s for the Afghans to negotiate with each other and accept each other,” he added. Radio Free Europe/Radio Liberty contributed to this report.